Ponant's five ships offer luxurious holidays in the Mediterranean, Caribbean and beyond — but also adventurous expeditions to far-flung destinations including the Antarctic. French luxury cruise company Ponant has five ships, all of no more than 132 cabins and suites, and the two which will join its fleet next year are “explorer style”, with only 92 cabins and an underwater lounge. Two more the following year will follow this theme, bucking the trend of bigger and bigger cruise ships. In increasing its fleet to nine ships, Ponant is going smaller, more intimate, more interesting, more boutique. I recently joined its ship Le Soleal, sailing along the Latin American coast in “cruise mode”. The blend of French-based cuisine, gentle excursions and days at sea make this a five-star holiday. But Ponant’s ships have another life in another mode when they are on expedition itineraries, particularly in the Antarctic. Cruise director Axelle Lion has spent four seasons with Ponant in the Antarctic, and knows the switch from the Mediterranean, Caribbean or these warm waters of Latin America well. “For the crew, it’s all about organisation and safety, for the passengers, flexibility,” she says. Although passengers know which areas their ship will be targeting, no full itinerary is published, as it is made on the run, on board, reacting to conditions. Axelle explains that in addition to her role looking after guests on board as cruise director, there will be an expedition leader, working closely with the captain to decide the day’s activities, and about a dozen specialist naturalists. 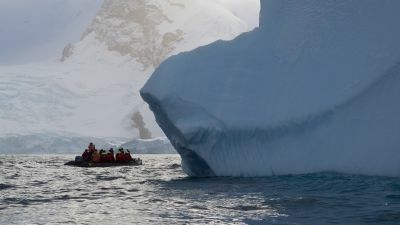 Voyages are paced between the shorter trips from Ushuaia on the southern tip of South America to the Antarctic Peninsula and back — usually two days there, six days in the Antarctic, and two days back — and longer expeditions which also include South Georgia and the Falklands. Ponant jackets are given to passengers as part of their fare, and boots lent. The ship is reconfigured to allow for the easier handling and drying of warm-weather clothing. Boots are placed outside the cabin on a special mat. Passengers are asked to carry them, and their outdoor clothing, to the lounge, then prepare to board Zodiacs, and decontaminate their boots when they return. There are announcements over the PA, and lots of lectures. A ship’s passenger numbers are kept to 200 (though Le Soleal, for example, can take up to 264) as only 100 people can land on Antarctica at one time. The team aims for the passengers, in four groups of 50, to experience at least two outings a day — some landings and some Zodiac cruises. And that’s where Axelle’s comments about organisation and flexibility really come in. “The Antarctic cruises get a different type of clientele — people who are not really cruising passengers,” she adds. They are not there for a cruise holiday, but for an Antarctic adventure. Le Boreal is not only a very capable ship, and very stable, but luxurious. It’s an interesting mix for such a dramatic destination. For hotel manager Florent Kuhry and his colleagues, there are other challenges on the expedition-mode voyages. “Supplies and provisions are quite tricky,” Florent says. “In Ushuaia, for example, things are more complicated.” While Ponant ships source supplies from all over the world, other provisions have to be driven four or five days by truck from Buenos Aires. Vegetables, salads and herbs then have to last a voyage of sometimes 16 days. And there’s no access to resupply, of course. “But we have been sailing in the Antarctic for 10 years, so we know what we’re doing. And we also need a creative chef.” Someone who can make delicious food from what is available at the end of a voyage. On my voyage on Le Soleal, it’s chef Yannick Sarrotte and his team, including a French baker. Ponant has three ships in Antarctica this sailing season which began towards the end of last year.